ONCHAN, Isle of Man – May 22, 2017 – PokerStars, an Amaya, Inc. (Nasdaq: AYA; TSX: AYA) brand, hit a new online poker tournament high yesterday when it achieved record-breaking total prize pools of more than $39 million in a single day, smashing the guarantee of $28 million by almost 40 per cent. The total prize pools made it the biggest day the online poker industry has ever seen. 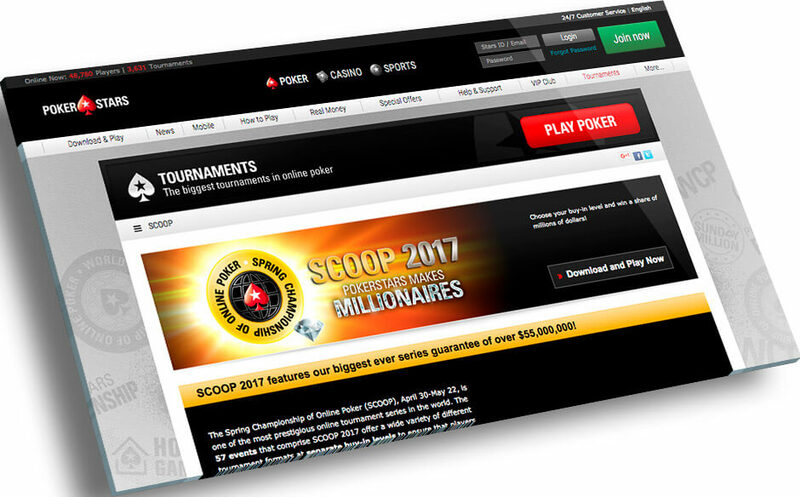 The Spring Championship of Online Poker (SCOOP) events yesterday delivered more than $29.5 million in prize pools. The High Stake Main Event smashed its $5 million guarantee to reach a $6,930,000 prize pool, meaning that there is more than $1.3 million set aside for 1st place and a massive $960,000 for the runner up when the tournament concludes tomorrow. Day 2 of the SCOOP Main Event will continue at 14:00 ET today. Team PokerStars Pros Elky and Andre Akkari are still in the running in the High Stakes edition, sitting in 46th and 80th places respectively with 80 places paid. Other players in contention include Phil ‘MrSweets28’ Galfond, Ole ‘wizowizo’ Schemion and Timothy ‘Tim0thee’ Adams. In the Medium Stakes event, Team PokerStars Pro Andre Akkari is in second place with Team PokerStars Pro Liv Boeree in 121st and PokerStars Team Online Jaime Staples in 181st place, whilst Canadian Ben ‘Ben86’ Tollerene is currently in eighth place. Another millionaire is also expected in the High Stakes Event 01 Phase 2 tournament, which has $1 million set aside for the winner and $700,000 for second place. Team PokerStars Pro Igor Kurganov finished in 52nd place for $10,012. The tournament resumes today at 12:30 ET. Yesterday’s total prize pool of $39 million surpasses the previous biggest day for online tournament poker pay outs – May 22, 2016 - which paid out $35 million. In NJSCOOP, the High Stakes Main Event also exceeded its $200,000 guaranteed, hitting a prize pool of $204,000 while the biggest non-SCOOP tournament was the Super-Sized Sunday’s $600,000 prize pool.